The perfect addition to any barbecued meat, fish or vegetables. 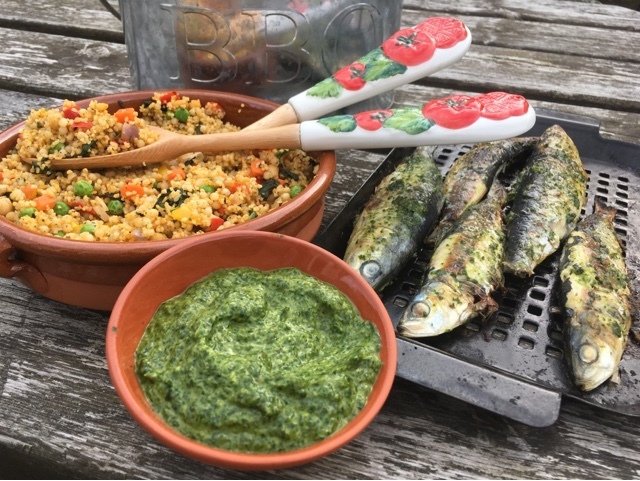 This seasonal Salsa Verde is made with Wild Garlic and in this recipe I've served it with Sardines and Couscous Salad. Well worth heading out to the woods and doing some foraging. As far as British Barbecues are concerned you have to grab the chance when the weather plays ball. This is where studious stocking of your freezer can play a part. The Power of Frozen combined with Sunshine can make for a perfect BBQ. Iceland Foods challenged me to come up with a dish to show off the many benefits of frozen food choosing from the categories of Value for Money, Convenience, Quality and Choice. Whilst the one I opted to base my dish around is 'choice' I actually reckon that it fits pretty well with them all. 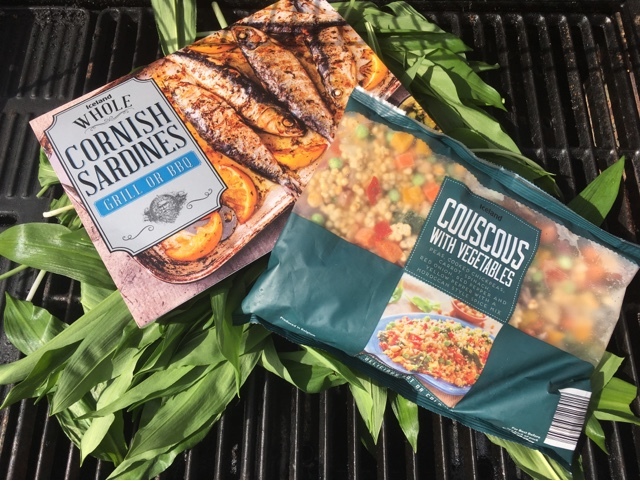 When I went for a wander round my local Iceland store at Aberdeen's Beach Boulevard Retail Park both the Whole Cornish Sardines and the Couscous with Vegetables most certainly fitted into the category of "I didn't expect to find that at Iceland". I have been increasingly impressed with their range of speciality fish and also picked up Crispy Whitebait. I simply cannot resit it when I spot it on a menu and up until now I've never seen it on sale anywhere. They were amazing served with lemon and tartare sauce and I can't recommend them enough! Apparently these are limited stock. I shall be filling my freezer. But back to the Cornish Sardines. These are cooked from frozen which means no requirement for a last minute dash to the supermarket when barbecue weather beckons. 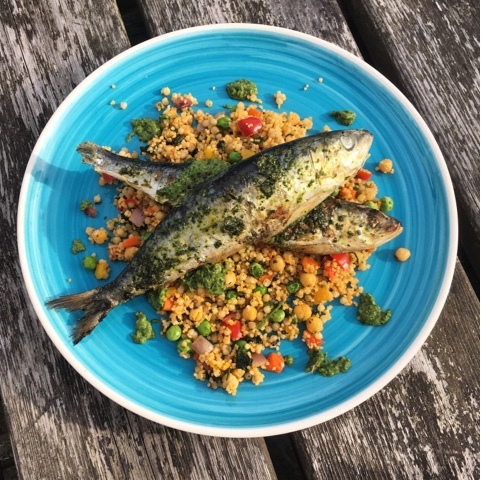 I've used the salsa verde, which essentially translates as green sauce, to give a lift in flavours to both the fish and the couscous. If you can't get hold of wild garlic you can substitute regular garlic cloves. The quantity made will be more than you require for this particular recipe but it can subsequently be used in numerous ways and works really well with seafood, steak, pasta and potatoes. I was really impressed with the frozen couscous and also picked up a bag of their Zesty Bean Quinoa which I've yet to try. Both can be microwaved or stir fried and served hot or cold. Loads of flavour and so much better than dried couscous packets. I'll definitely buy it again. The sun is out, the BBQ is lit and the heavens open. Fear not you can still make my recipe below on the grill but let's hope that the promised May heatwave does put in an appearance. I'd advise optimism and stocking up your freezer! Cook the Iceland Couscous with Vegetables from frozen according to the pack instructions, allow to cool then refrigerate until cold. It contains a fantastic mixture of giant and regular couscous with peas, chickpeas, carrot, spinach, red onion, red & yellow pepper with a Moroccan style spice mix. 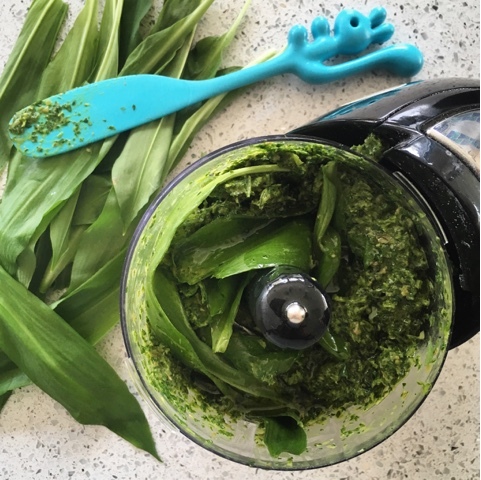 Blitz together all the wild garlic salsa verde ingredients in a mini food processor or with a stick blender. Taste and adjust seasoning and consistency if required. 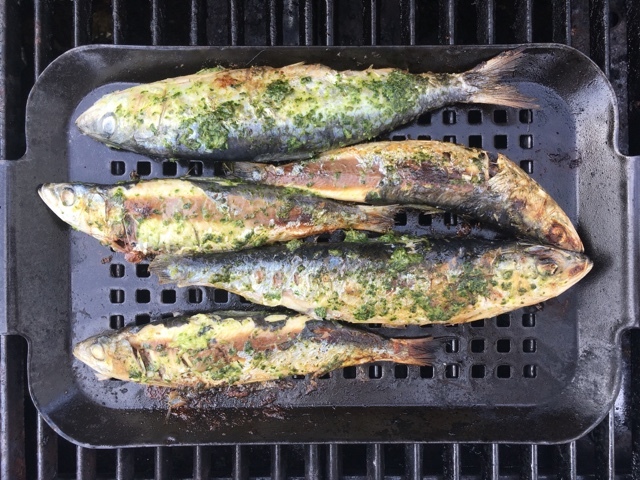 Brush the sardines with some of the wild garlic salsa verde and barbecue (or grill) for 15 minutes turning once. 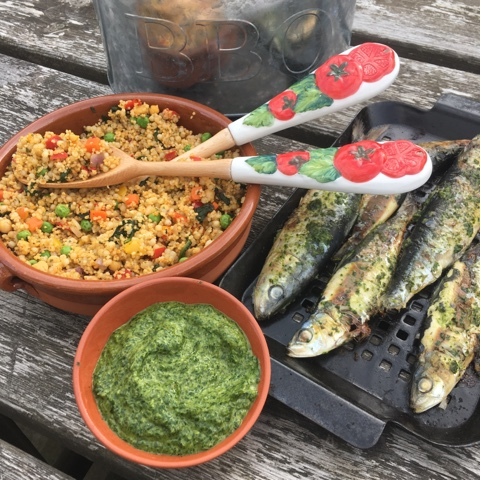 Stir a tablespoon of the wild garlic salsa verde through the couscous and serve the Cornish Sardines on the top. Disclosure: This is a commissioned post for Iceland Foods. As always, all views expressed are my own. Oh - this is my ultimate meal - sardines and couscous in one place. Go #PowerOfFrozen. It was amazing! I'd defy anyone at my BBQ to realise that both products were frozen. What a lovely summery recipe perfect for outdoor dining. Everything tastes better when eaten alfresco! Lets hope we get the weather to enjoy the rest of the Iceland stash in my freezer whilst the sun shines. I always thoughts sardines were small, not at all the big beauties you have plated. They sure look delicious, but is it really salty? Sardines can be up to 15cm in length! These ones are definitely bigger than those you get in cans that's for sure. Not salty at all, just freshly frozen. Oh my this looks delicious! Loving everyone's #PowerofFrozen recipes! Such great inspiration across the whole #PowerOfFrozen hashtag. Way more to frozen food than fish fingers and peas. Haha our BBQs usually start with a mad dash to the shops as soon as we notice the sun is shining - it definitely sounds more convenient to have BBQ ingredients on hand in the freezer! Yup and everyone else dashes to the shops too and the shelves are bare! Much better to have a stock of barbecuable goodies in the freezer. Apparently it's the start of a heatwave! Definitely time to head to Iceland and stock up your freezer. I think they are a recent addition to the Specialty Fish range. This was certainly the first time I'd spotted them. This sounds like such a great summery meal! 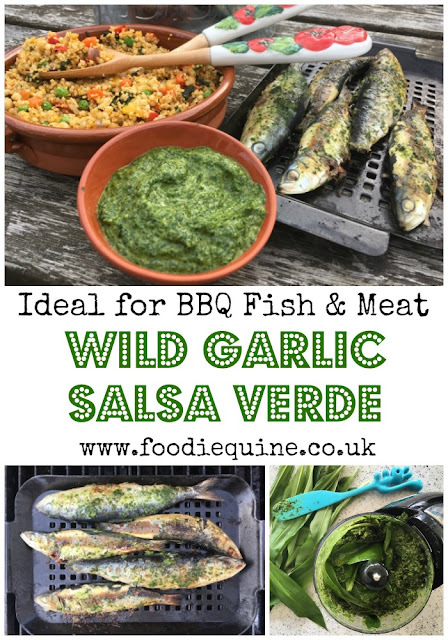 Love the fact you can have that lovely couscous and sardines in the freezer and just need to whip up the salsa verde! Through the #PowerofFrozen campaign I've really been made aware of how much Iceland has changed for the better recently. They are constantly upping their culinary game, and I have genuinely been stopping in to help with my shopping. This is an absolutely gorgeous and clever way of combining quality frozen ingredients with ultra-fresh (wild garlic! ).